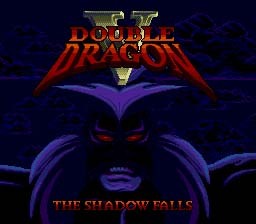 Play Double Dragon 5: The Shadow Falls Now! Double Dragon 5 is very different from its predecessors. This is the first Double Dragon that wasn't a side scroller. This game was actually a fighter. It's a lot like Street Fighter, or Mortal Kombat. There are three modes of gameplay, tournament, versus, and quest mode. In tournament mode, you will fight people at random, it's a good way to prepare for quest mode. In versus mode, you will need a friend to beat up. In quest mode, it will tell you a sort of cheesy story as to why you have to fight all these people. It's not a bad game except for the fact it's been done a million times, but I guess it's a decent change from the same old Double Dragon story. If you are a fan of fighting games or a fan of Double Dragon, this game is for you. The only difference I can see between this one and the SNES version is that this version features blood. Fight your way through tournament mode, or battle head to head with a friend. At the main menu press C, Right, A, B, A, B, B, Left. You will hear a laugh if you did this right.